Teluk Intan to Bagan Datoh area is the main coconut plantation in Malaysia. Even though most of the plantation is planting oil palm tree but there still have some coconut plantation. There is a Coconut Institute government sector located in Bagan Datoh. Coconut has many species and application. One of the reason we are buying coconut is for drink purpose. Most of the coconut sitting in supermarket shelf for sell are always free from it outer layer fibre. I always wonder how good or how effective the coconut fibre could be removes, because it is so thick and dense. Until I am seeing the worker peeling the coconut coir, I am very sure, this could be the most effect way. A coconut is covered with a thick coconut fibre or coir, the thick coconut fibre shall be removed before it start shipping to city for drinking purpose. The thick coconut fibre layer has to removed in order for saving transportation and storage cost, secondly the coconut fibre also has other application which worth for money. 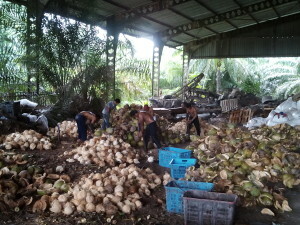 I had made a visit to one of the coconut factory in Bagan Datoh area. The owner bring me to his work space and storage. It is an open space factory building full with coconut and it separated parts, such as fibre layer, coconut shell and inner layer of coconut fresh. There are total 5 workers gather at one area, they are at standing position of peeling the coconut fibre. Surrounding them, there are several pile up of coconut fibre and removed fibre coconut. The workers are experience workers with several years peeling fibre experience. They are able to peel 800-1000 coconut per hour. The tool for removing the coconut fibre is pretty simple, just a sharp spade size tool standing on the ground. The worker will inject the coconut into the sharp spade, with a simple peeling action, the coconut fibre is separated from the shell. With 3 to 4 peeling, the entire coconut fibre is removed, the whole process takes less than 10 second. There is no other tool involve besides the sharp spade tool. I know sometime is very hard for me to illustrate the peeling action, but it will be more easy if I could illustrate by video clip. You could see this peeling action via clicking “Peeling Coconut Fibre”. My visit to this coconut workshop is a fruitful trip to me. I learn a lot via the short trip. Now we already understand how the worker remove the coconut fibre, we will discuss other coconut application in other article.